This is SKYRACK number 78, dated 9th May 1965 and published by Ron Bennett, 52, Fairways Drive, Forest Lane, Harrogate, Yorkshire, England. 2/6d for 6 issues. 35cents for 6 issues in the USA (airmail 70cents) where subscriptions may be sent to that Grand Old Man of Indiana fandom, Robert Sebastian Coulson,. Route 3, Wabash, Ind. 46992. 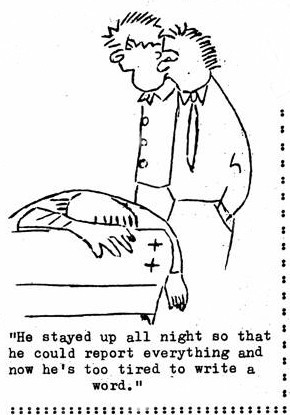 Cartoon reprinted from Skyrack No. l7 by Arthur “Atom” Thomson. Birming ham convention coverage by Doreen Parker and Christopher Priest with inter-round summaries by J.Barrington Dalby. Please note that the address is Fairways Drive; also that whilst mail has in the past been forwarded from Newcastle Road, Liverpool, that address is now out of date. THE 1965 NATIONAL CONVENTION was held under the auspices of the B.S.F.A. in Birmingham during the Easter weekend, from Good Friday,l6th April to Easter Monday 19th April. About seventy fans and professionals attended the Con at the Midland Hotel, New Street, and whilst it was an enjoyable weekend, it was not the most memorable of conventions. Undoubtedly the attendance, small for recent years, was overshadowed by the forthcoming World Convention in August. The Committee at Birmingham worked hard to produce a good convention but the lack of names to draw upon for programme items, in a purely qualitative sense, meant that the variety of the programme items was limited and perhaps in all the programme was somewhat unimaginative. THE CONVENTION OPENED on the Friday evening with short introductions, appeals to support Great Yarmouth for next year’s consiting, and a brief encounter with a tardy arrival in the shape of Harry Harrison who excused his late coming on the grounds that the opening ceremony had been late, a readily accepted excuse! THE REMAINDER OF FRIDAY EVENING was devoted to a showing of three cartoon shorts and the feature film Forbidden Planet which was last shown to convention audiences in Gloucester at the 1961 LeXIcon. QUOTE CARDS were also prevalent. Though not in the abundance of last year, they appeared from several different sources. Archie Mercer produced. a confetti-like series of “do it yourself” cards. A CURIOUS INNOVATION to the Saturday morning programme was the manner in which breakfast became an auction session, with Phil Rogers acting as auctioneer and Beryl Henley uncovering a plot to lower the gold standard. by infiltrating French francs into the auction funds. GEOFF DOHERTY, now a training college lecturer, gave the first talk of the convention, citing definitions like “fantasy is non-statistical fact” and coming to the conclusion, via the opinions that the best sf comes from fantasy and that a good story comes only with the authority of experience, that there is no real difference between sf and fantasy. GEORGE SCITHERS, 1963 DisCon Chairman and Hugo Award winner for his fanzine, Amra, then spoke on the reasons behind the TriCon bid for the 1966 Worldcon siting. Ordinarily, the siting of the American worldcons does not play a large part in British fan affairs. This year, however, the British fan is being wooed earnestly for his vote for the voting for the siting of any world con takes place at the previous world con, thus the voting for next year’s siting will take place in London in August. And of course, the audience will undoubtedly be predominantly British. There are two bidders for the 1966 gathering, Syracuse and TriCon. Originally, the TriCon group was made up of rival factions from Cleveland, Detroit and-Cincinnati, all of whom have now amalgamated their interests with a provisional convention hotel in Cleveland and with a guest of honour already lined up. The TriCon argument is basically the Rotation Plan, the system under which the worldcon sitings circulate in the USA. Obviously, in a country the size of the U.S. it would be unfair to hold every convention on say, the east coast. Accordingly, the Rotation Plan has been in operation for a number of years. The 1964 Worldcon was held on the west coast of America and by rights, under the system, this year’s convention should be held somewhere in the centre or “mid-west” area. However, London has stepped in and has accordingly put back. the rotation plan by one year. It seems to follow, therefore, that if one agrees with the rotation plan then the TriCon bid is the obvious one. THE SATURDAY AFTERNOON programme was devoted to the showing of two professional films, The Conquest of Space and When Worlds Collide. THE TRADITIONAL SATURDAY NIGHT PARTY this year sported the title of Mad Raving Saturday Night Shindig. The level of ingenuity and originality was well up to the standard of recent conventions, with Beryl Henley as the Scarecrow from The Wizard of Oz and Brian Burgess as a meat pie. Rumour has it that Alan Dodd was present, disguised as a quote card. Once again the honours went to the Delta group, with Peter Day and Bill Burns taking first prize as - to quote the spokesman for the panel of judges, Ted. Tubb - "The Mad Scientist and his Tame Assistant.” Chuck Partington was second. as “The Man with the Head and the Teeth” and. Harry Nadler was third as “The Atrocious Monster with a Gun in his Mitt!” By some sort of mutual consent, the party left the con hall to its own devices and moved on to Jimmy Groves’ bedroom where it continued well into the early hours, one of the weekend’s undoubted highlights. AT THE ANNUAL GENERAL MEETING of the BSFA on the Sunday morning it was announced that the association had a paid membership of 269. Roy.Kay took over the Chair from the retiring Chairman, Ken Cheslin, and Librarian Joe Navin was elected Vice-Chairman, beating Charles Platt in a straight vote. Graham Bullock resigned as Secretary and Doreen Parker, who had had her car removed during the weekend (it was later found by Ted Tubb not far from the hotel), agreed to step into the breach. Charles Winstone continues as Treasurer and Roger Peyton as Publications Officer. NEWLY APPOINTED vice-chairman Joe Navin announced that he would shortly have to surrender his post as Librarian and that the whole Library, the largest purely sf library in the world, would be transferred to the hands of John Nash. Mike Turner agreed to look after the fanzine side of the Library. VECTOR’s sister magazine Tangent was discussed at length, editor Roger Peyton mentioning that he had had. over 70 responses to the first issue. It was generally agreed, however, that before a second magazine is consolidated then Vector itself should be put on a more professional basis. Comparisons were drawn between Vector and the Delta Group’s fanzine Alien Worlds, which is now produced in photo-litho. It was pointed out that the expense would probably be prohibitive (it might also have been pointed out that an abortive attempt to produce Vector by this method had been made in the past) and the Alien Worlds editors were asked whether they would agree to producing Vector. They regretfully refused because of other commitments. YARMOUTH ‘IN ‘66. At Peterborough last Easter it was proposed that the 1966 Con be held at Great Yarmouth and now Phil Rogers confirmed that the hotel had been booked (inclusive price £3 per day). A Guest of Honour had been approached and had accepted the invitation. Registrations are being accepted. Watch this space for further details. Suggestions were made for the 1967 consiting, these causing some amusement until Phil Rogers pointed out that it had taken a full year to finalise the great Yarmouth arrangements (It’s taken most people a year to find Great Yarmouth on a map). Brian Burgess proposed that the 67 con be held in Leeds as this would properly mark the 30th. anniversary of the first British convention. Neither Mike Rosenblum nor Ron Bennett was present to boggle at the suggestion, but in any case the suggestion drew no seconder and Tony Walsh, mentioning that he and Simone would soon be moving to Bristol, suggested that Bath might be a suitable site. Somewhere in the West country certainly met with the meeting’s favour and the motion was carried.. THE DOCTOR ARTHUR ROSE WEIR MEMORIAL AWARD, presented by the Association each year for tireless devotion to fandom was this year won by Terry Jeeves, ex-editor of Triode and one of the Association’s first officers, an admirable choice. THE GUEST OF HONOUR’s speech has been widely reported in the national press, an unusual achievement in itself for conventions. But Harry Harrison is an unusual person, a man who lives as distinct from existing and who is the author of many recent and enjoyable works, such as The Stainless Steel Rat, Deathworld., The Ethical Engineer (Deathworld II) and Planet of the Damned. The Manchester Guardian described the talk thus: “This performance goes on for an hour during which he barracks the Salvation Army band playing outside, throws a meat pie at a friend in the back row, ignores a boy playing with a large, black toy spider in the third-row and makes a few esoteric asides to one or two fellow professional authors.” Harry actually began his talk, “SF Confidential” by awarding an original manuscript to Mike Beard for naming the Tom Boardman-published crime series, the Boardman “Bloodhounds” (ah, shades of Brown, Boland and Dewey). He mentioned that various American professionals would be attending the London Worldcon in August and took it upon himself to warn his audience of what they might expect. Poul Anderson, he said, had a name which is consistently mispronounced. He then asked his son to step up and pronounce it correctly. He spoke of Fred Pohl in agenting difficulties and owing a well known professional about $1,000. The author went to see Pohl about the money and ended up by lending Pohl a further thousand. Talking of his own editing career with Rocket Stories Harry demonstrated the standard of batches of manuscripts he would receive in bulk from a West Coast agent. Eventually the state was reached where Harry was merely bundling up the manuscripts unread and returning them. Few authors escaped these revelations of the previously best kept secrets of American prodom. Blish, Kyle, Shaw, Campbell, Gernsback, Silverberg, Moskowitz, Knight and Ackerman were all attacked and the laws of libel obviously prevent an enlarged report. THE PROFESSIONAL PANEL, consisting of Tom Boardman, Ted Tubb, Michael Moorcock, Brian Aldiss, Chairman Harry Harrison and James White, spoke on the difference between American and British sf, agreeing generally that there was a difference in authors’ rates but not necessarily that the best SF came from America. On the length of time it takes one to write a story the panel agreed that this depended on the story; one might take weeks, another years. Ted Tubb spoke of being under contract and writing a novel in a week. On reviewing, Tom Boardman felt that a review should be limited to publication facts and a general synopsis, whilst Brian Aldiss went a little further, pointing out that whilst there was possibly a difference between a review and a criticism it was not the reviewer’s place to make personal attacks upon the author. SOMEWHERE ALONG THE LINE the Panel metamorphosed into an auction which was an object lesson in how to sell, with a Poul Anderson book selling at twice its cover price and an empty whiskey bottle being sold for 4/6d. DAVE KYLE spoke of the Stateside rival bid to the TriCon for the 66 Worldcon. Dave, a radio station owner and practically a regular attendee of British conventions, is backing the Syracuse, New York State, bid. Dave pointed out that even within the legalities of the Rotation Plan, the Syracuse bid is quite proper, that if three quarters of the electorate votes for a siting “out-of turn” as it were, then this is not contrary to the Rotation Plan and that all Syracuse needs therefore is a 75% support (presumably therefore, should the Syracuse bid succeed by between 51% and 74% then the 1966 con still would go to TriCon?). Dave argued that a “one bid” for a convention in an entire area is an unhealthy state of affairs and that competition is desirable. Syracuse is keen and well prepared to hold a convention next year, that if TriCon are to be voted the con; then they will have to show that they deserve it over and above the Syracuse nomination, and that should Syracuse be defeated then they will be back again to bid for 1967, “offering you a choice based upon merit and not by default”. THE CON PROGRAMME BOOKLET was produced by the Birmingham Group, liberally and ably illustrated by Mike Higgs who was also responsible for the rather smart lapel badges which were a complete break from the tradition of previous years.